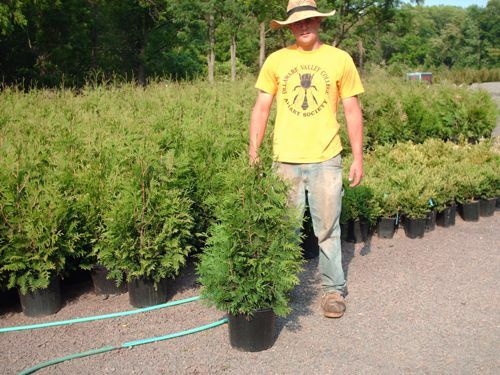 Highland Hill Farm has been growing arborvitae since the farm has started. The arborvitae is an excellant plant for blocking neighbors without forfitting much of your back yard for the plant to grow on. Most arborvitaes are upright in grow. For example the popular emerald green arborvitae grows only 3 to 4 feet wide and makes an excellant hedge or buffer. On the other hand, the elangtissma arborvitae can be 6 to 7 feet wide. Each type of arborvitae has strengths and weakness. Take time to read into each type of arborvitae to see which one is best for you or you call e-mail your situation. We love to hear from you! All questions will be answered. Call us at 215 651 8329. 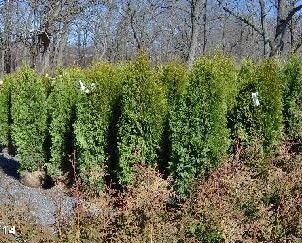 The Green Giant is our most popular arborvitae. Its main use is as a fast growing buffer. People have traveled from New York and from Virginia to buy these arborvitae. If you have a brown thumb, these are the plant for you.Plus we can deliver and plant. 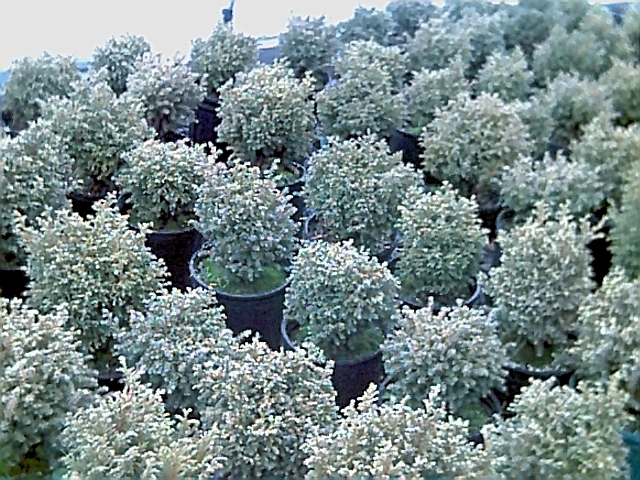 This dense, compact, 3' Emerald Green Arborvitae is carried by many growers. Great for small lots. This arborvitae is not deer resistant. Their maximum height is about ten to fifteen feet. It retains its color through out the winter. These are our 5 to 6 foot tall Nigra Arborvitae. They are great for screening and buffering. Medium Height in growth. The arborvitae is used to create privacy for properties. The arborvitae is an evergreen plant. Evergreens retains foliage through out the winter. Plants that lose their leaves in the winter do not provide as much privacy during those months of the year. What really makes the arborvitae the best privacy plant is the dense foliage. 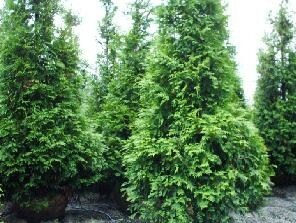 The arborvitae has great foliage because even at very close distance, it is full enough to give you privacy. Make sure you get the correct Arborvitae for you property... we can review your site if you send us photos. It is not full at a distance and sparse and open when close to the plant. Planting the arborvitae close to one another can be accomplished. Emeralds are planted on a 3 foot center. 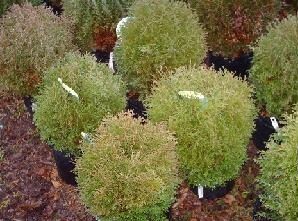 The arborvitae will grow into one another and creates a living wall for you.. This does not hurt the plant at all and native arborvitae do this to survive. d to be Trimming of arborvitae is beyond simple. They are called an indeterminate plants which means that arborvitae grow from growing points and not from their buds. 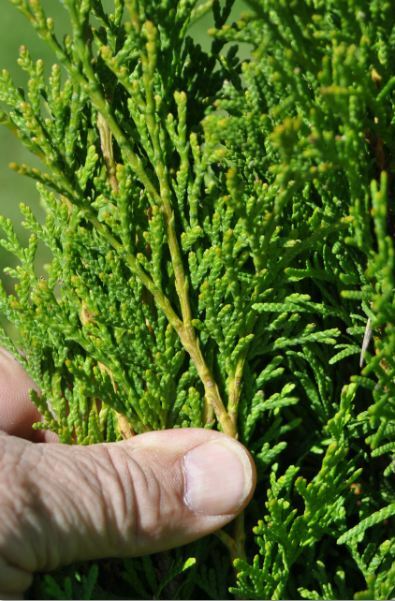 These are found at the tips of the arborvitae and are responsible for making the branches grow longer. Removing them will keep the plant from growing as high and will make the plant wider. For best results, only trim the top leader of your arbs. 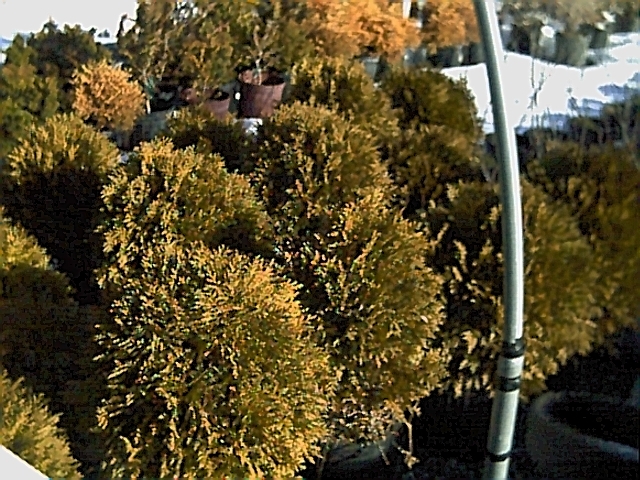 Since arborvitae do not have buds, trim them at time of the year. We typically trim during the winter just because we have more time available. 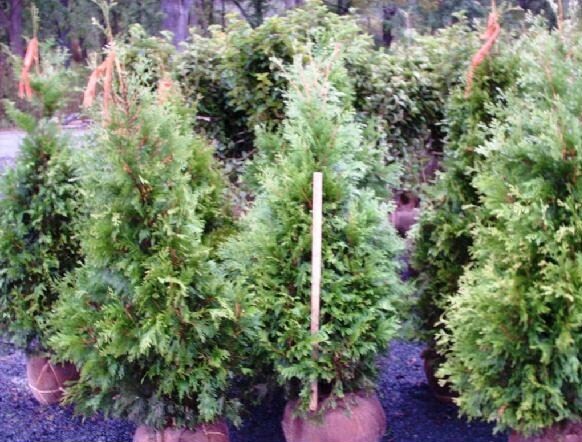 Arborvitae grow by growing points which are the lighter green in color. A very nice example of a globe arborvitae. Globes are rounded plants that do not need much trimming to keep its shape. Columnar Arborvitaes are great for yards that do not have much room. They can grow tall but not wide which means that they have to be planted closer together to make a wall. The emerald green is an excellent example of columnar plant because they only grow 3 to 4 feet wide. Pyramidal arborvitae becomes thinner as it gets taller. The base should always be wider except if it has been trimmed. They have great shape and can be used with excellent effect in landscapes. The roots of arborvitae are considered to be small and fiberous. They are predominately small with many speghetti like and thin roots. These roots are more desirable because when the roots travel under pavement or blocks, they do not "bubble" up disturb it causing sidewalk or foundation problems. The roots are typically with in the top 9 to 12 inches of the ground except in very sandy conditions where they found deeper. In general, the arborvitaes like moist well drained soils. They can take the pooper soils of new developments fairly well but try to avoid year round wet soils. If the soils are wet only after rains which is common, then elevate the balls when planting. Also shy away from potted material in those conditions. 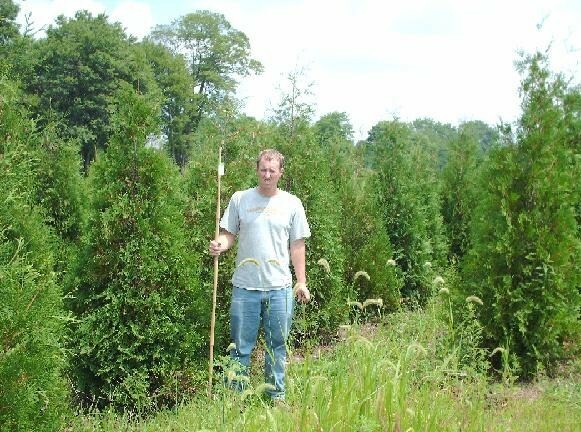 Here is Jamie with his american arborvitae in the feild. We do not allow for customers to go into the field to pick plants but you can pick out the ones you like in the yard. If you have any questions about anything you see or read, please call us at 215-651-8329. My name is Mike Hirst and I graduated from Delaware Valley College afew years ago. I majored in floraculture and I have worked my entire life at Highland Hill Farm. I will try to anwser any question you have or get back to you with the best information that I can find. Thank you.